One of the most interesting parts of the MRI project is cataloguing the papers of Sir Peter Mansfield which have been donated to Manuscripts and Special Collections. These relate mostly to his professional life, although there is also a small quantity of personal papers. The largest parts of the collection are published academic papers and journal articles, correspondence about his patents, and papers relating to his own research. The application of nuclear magnetic resonance (NMR) to magnetic resonance imaging (MRI) was a new and exciting field in the 1970s and 1980s. Given the potential practical applications in the field of medical scanning, Sir Peter appears to have been keen to protect his discoveries by patenting them where possible. 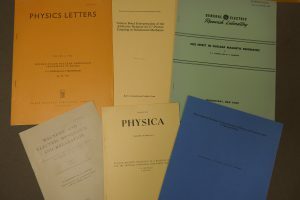 He took out many patents based on the results of his research, sometimes with his colleagues as co-inventors, and the patents-related correspondence in the collection ranges from 1974 to 2010. Getting a patent granted successfully could take years of detailed work, and Sir Peter used the Nottingham firm of patent attorneys Eric Potter & Clarkson (now Potter Clarkson) to act for him. 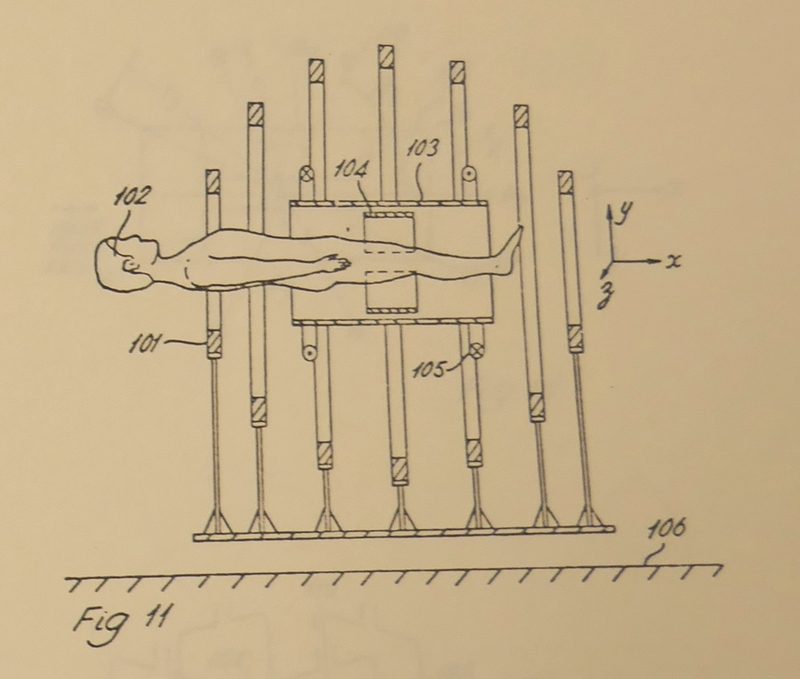 Producing a clear description of the exact techniques or devices being patented was not always an easy task, and in those early days any accompanying diagrams had to be drawn by hand by the inventors before being rendered by a professional graphic artist. To fully protect an invention, patents had to be filed separately in each country, and the collection contains correspondence relating to patents in the UK, US, Japan, the EU, Israel and China. Filing a patent was generally only the start of the process, because the patent authorities would then raise queries, objections (often because of similarities to existing patents) and sometimes even rejections, each of which had to be considered and responded to by Sir Peter, his co-inventors and the patent attorneys. Some of the early correspondence in the collection refers to how Sir Peter was keen to file patents ahead of other scientists such as Paul Lauterbur in the US. This demonstrates what a rapidly moving field MRI was in the 1970s when the basic techniques were being discovered and refined. Other topics covered in the correspondence include the division of royalties that resulted from the patents, and cases where Sir Peter felt that his patents were being infringed. 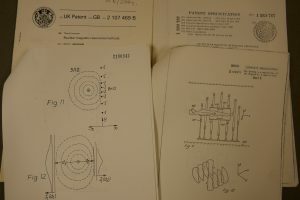 Some examples of the patents granted to Sir Peter over the course of his career were ‘Image formation using nuclear magnetic resonance’ (with Allen Garroway and Peter Grannell) in 1977, ‘Nuclear Magnetic Resonance Methods’ (with Roger Ordidge) in 1985, ‘Echo Planar Imaging Systems’ (with Roger Ordidge and Ronald Coxon) in 1992 and ‘Active acoustic control in quiet gradient coil design for MRI’ in 1999. The published academic papers and journal articles within the collection are also extensive, consisting of around 200 papers authored or co-authored by Sir Peter, and 700 papers not written by him but which he kept for reference purposes. These numbers indicate what a productive field NMR and MRI research was during Sir Peter’s working life, and the extent of his own contribution to it. He and his collaborators published in a wide range of journals including Physical Review, Journal of Magnetic Resonance, Polymer, Journal of Scientific Instruments, British Journal of Radiology, Philosophical Transactions of the Royal Society, and Magnetic Resonance in Medicine. There are also many handwritten and typescript drafts of Sir Peter’s published papers to be found within his research notes, together with copies of the photographs and diagrams produced to illustrate them. We will be writing more about our cataloguing of these research notes in a future blog post.